It’s actually from his upcoming Gnarly Davidson project. 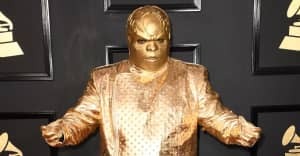 CeeLo Green has clarified that he is O.K. after footage of a cell phone exploding while he was using it went viral this weekend. The clip circulated on Saturday, December 17, and purported to show CCTV footage Green taking a call in the studio. In it, the phone explodes while Green held it to his ear, knocking the singer out of his chair and onto the floor. However, Green has confirmed that the footage was misleading and is actually a small part of a bigger project he is filming for. The singer posted a Facebook Live update in which he said, "I just want to let everybody know that I am alive, and I'm well and I'm O.K. "Truthfully, I'm really upset that anybody had to be emotionally disturbed by what they saw today." The singer went on to add that the footage will feature as part of the launch of a new persona he is working on. "Actually, what you saw today was a clip from a smaller video that we were shooting for a new project I'm doing called Gnarly Davidson. It's supposed to set up and introduce the new character identity, you know what I'm saying?" Green explained. "I'm still gonna release the music, though," he added. "But first and foremost, for everybody that love me and care about me, I just want to say that I'm O.K. I just want to thank everybody for their love and support and concern." You can watch the Facebook Live video below.